DT4EMS is a company founded by Kip Teitsort in 1996 that teaches “tactics” to EMS and firefighter first responders to recognize and prevent assaults. It happens more often than you might think - responders arrive on scene responding to an emergency call, and a patient, bystander, or family member physically assaults them. 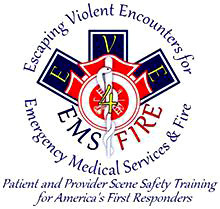 DT4EMS’s Escaping Violent Encounters program provides superior training affording staff the critical thinking skills to protect patients, staff and the agency. At the Ready first got to know DT4EMS about a year ago while doing a story on their courses. Since the article, the largest hospital in Phoenix, who has several certified DT4EMS instructors on staff, is conducting a study on DT4EMS’s Escaping Violent Encounters programs to prove efficacy. Presents the problems faced by administrators regarding the use of force on the job and points out potentially liable actions for failing to train staff for the use-of-force on the job in emergency medicine. 2. Violence in Emergency Medicine; Is it really an issue? Covers statistics, real news stories and personal interviews with EMT's. Paramedics, and Nurses to show the issue with violence and the use-of-force in medicine. Exciting and energetic- thought provoking presentation. Click the video here for more. Teaches how the mind processes information, particularly during a stressful event like a violent encounter and how to prepare for the 3 F's (fight, flight or freeze). Exciting and thought provoking presentation. Here is a link to some of the information presented. 4. Jaded: Is that what is expected in emergency medicine today? At the Ready is very excited to have DT4EMS joining the Expo Series program, and to make these courses available to all responders. As Kip puts it, “If people employ our tactics, they may never have to use our techniques.” These courses are designed for all EMS, Fire, and other emergency personnel. For more information about DT4EMS visit their website. Pre-Registration for all Expo courses will be made available as our regional partners are announced. Best of all, attendance for all first responders will be FREE. Our goal is to facilitate as many first responders as possible for each event- so each event will go into the weekend, conferences will be open later in the evening, and to provide for shift work, we will schedule the classes and workshops by national experts in the field so everyone has the maximum chance to attend. Local (state certification) classes will be taught by certified instructors in the field to ensure your time spent training is recognized. All national, state, and local requirements will be met so you leave with effective training to take back and benefit the community you serve.